We haven’t been open for too long here in Vernon Hills, but we’re happy to say that people are discovering our kids’ gym. Not only are more kids getting more exercise with our Junior Boots program, but parents are also discovering the many advantages of choosing Hot Ground Gym as a kids’ birthday party place. Like any small business, we look at the data and have found quite a few reasons why we’re a first choice in kids’ party ideas. Let’s find out why our gym for kids is heating up at Hot Ground Gym. There’s no doubt about it, we’re new to the area! We had success at our Northbrook location and decided it was time to open another kids’ gym so that kids could have another birthday party place to enjoy. But it’s not just the fact that Hot Ground Gym is new that draws people in; it’s the fact that it’s a completely new experience. There have been laser tag centers and arcades since the 1980s, and bounce houses have been played out. But our American Ninja Warrior-style obstacle course for kids is a new idea that all kids enjoy. First of all, we’re a drop-off party place, so parents are more than welcome to head off and get a couple of errands done while their kids have a great time at our kids’ gym. Of course, what we do here at Hot Ground is so interesting that we’ve had more than a few parents stick around and watch as their kids beat the obstacle courses. Second, parents are always looking to make their kid’s birthday party unique. If they didn’t know about Hot Ground Gym, they will now! The parent who has the kid with the next-soonest birthday is going to be happy that you introduced them to a new kids’ birthday party idea! One of the most fun parts about Hot Ground Gym is how dangerous it feels. Kids really feel like they’re pulling one over on their parents and getting away with something dangerous. There’s something to be said for letting kids run around and act crazy on play equipment. But at Hot Ground Gym, we’re considerably more organized in our approach, giving the kids attending the party a “roll and a goal” in order to make sure they’re not only getting the physical activity but also to exercise their brains and their social skills. It’s a similar approach to the five key parts of our Junior Boots program: obstacle course fitness, teamwork, discipline, leadership, and critical thinking. Because it’s so well organized, kids have a great feeling of accomplishment when they leave our gym, something that’s hard to say about other kids’ party venues. 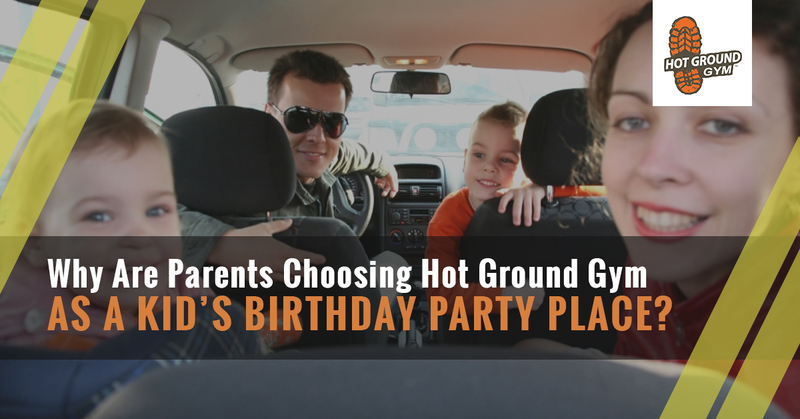 The fact is, Hot Ground Gym is the newest, and, as our name suggests, hottest new kids birthday party place around. Find out more about the birthday parties we offer in Vernon Hills right here!